Collection Complete April 2018. Thanks to generous contributors, JJCCF’s Financial Assistance / Advocacy Programs and collaborative support from partner charities, this family benefited from having access to basic human needs during a dreadful time. After being diagnosed with Ewing Sarcoma on 6/8/17, Alexis immediately started receiving intensive chemo to reduce the advance stage tumor extending from his pelvis down to his leg. Although his 10 hour surgery on 9/26/17 went well, he needs a wheel chair and his mother’s help 24/7. Alexis will soon start 5 months of chemo as his mother worries about keeping a roof over their head. Alexis and his family need immediate help to pay for car payment, rent, FPL and food. 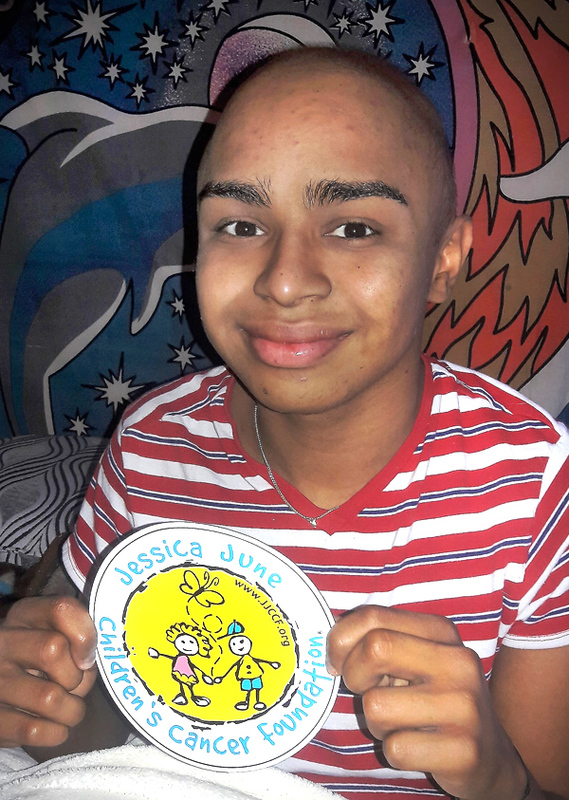 This letter is on behalf of an amazing kid named, Alexis Altamirano, a 17year old male who began to battle Ewing Sarcoma on June 8, 2017. Alexis is currently receiving intensive treatment as the tumor is in an advanced stage. Alexis will undergo surgery this week to remove the tumor. During the process of beating this battle, Alexis’ mother, Niurka has faced financial hardship as she is a single mother who raised two kids on her own. I’ve known Ms. Niurka since day one and she has shown integrity, hard work and hope. Ms. Niurka has been through this path before with her sister however, her goal is to be present in every moment for Alexi’s treatment as she does not have support. Ms. Niurka is concern about surgery as she does not know how long will it take for Alexis to recover. Ms. Niurka is in need of financial assistance and will benefit from the Advocacy program during desperate times were she feels that she does not know what to do. Thank you Jessica June for always instilling hope to those families that feel like they have no hope. We appreciate what you do! My name is Niurka Aguero and I am a single mother of two who just found out my son has cancer. Being a single mother during this past year has not been easy; I had times when I work two jobs and went to school during the weekends and studied until midnight. The effort was all worth it because it was done for my kids to give them a better life. I was told Alexis had Ewing Sarcoma on his pelvis where he has a tumor. My world changed in a minute. I had a sister who raised me like a mother who had Breast Cancer and lost her battle. It was a pain that I believe will never go away; I just have to learn to live with it untill the next time we meet again. After 6 months of my sister passing, they found 4 tumors in my uterus and it was removed at age 35, but I was thankful to God for letting me live and have another chance. I never thought I would encounter again this disease and through one of my kids, the pain is excruciating with the fact I even beg God to give it to me instead of him. We never want to see any kids suffering this disease. When his tumor was found, it was too big to operate. He began chemo to help reduce it. I was out of work for a month and a half giving up even my money to pay the rent to make sure Alexis had his procedures done. All I wanted is for him to get better. I had to go back to work because everything was just falling behind, but the torment of having to leave him alone at the hospital because I have to work breaks my heart. As I am writing this letter in the hospital, I was only able to work one day this week because he has been very sick. The doctor is planning to operate him the following week, opening him from his waist to half his leg; it is a big surgery. I don’t know how long I will have to be with him while he recovers, I don’t know how I will be able to pay for food and not to end up on the street because I can’t pay my rent this month. I applied for Social Security for the first time asking for help. After working in this country for 27 years, they told me I will receive $365 dollars monthly to support my kids. How am I supposed to pay for his treatment and medications? After working hard and never asking for help from the government, I feel betrayed by the system. All I have in my mind are my son’s words of asking me not to leave him alone. I feel desperate and ask you if you can please help me. Any help is a blessing. I pray to God to give me strength to help me save my son.